More than 200 farmers from South Africa have applied for humanitarian visas in Australia after allegedly suffering attacks for being white, according to the Australian Home Affairs Ministry. ?The type of criteria they of course have to meet ? or the key one ? is evidence of persecution, so that's exactly what we will be looking at,? Home Affairs Deputy Secretary Malisa Golightly said. Home Affairs said 89 refugee visa applications relating to 213 people had been received, although they did not specify their ethnicity or any other details. Following the reports, Australian Home Affairs Minister Peter Dutton announced his willingness to start fast-tracking humanitarian visas for South Africans who had endured violent rural crime at home and wished to move Down Under. The step was slammed by the South African opposition, which called Australia, and those willing to escape there, ?racist.? The controversial legislation was endorsed by South African President Cyril Ramaphosa, who pledged to hand the lands owned by white farmers since the 1600s to black citizens of the country without compensation for the owners. South Africa?s 50 million citizens are predominantly black, but 72 percent of farmland reportedly belongs to whites. This is the first time since 1999 the category hasn?t included a white male artist or musical group. For the first time since 1999, not a single white male artist or group was nominated for the 60th annual Grammy Awards? Album of the Year category. This year?s nominees are Childish Gambino, JAY-Z, Kendrick Lamar, Bruno Mars and Lorde. Additionally, all five tracks nominated for 2017′s Record of the Year came from artists of color. The Grammys have been under fire for their lack of diversity over the years, so an absence of white men in the top category this year could signify a sea change in the organization. This story has been updated to clarify that this is the first time since 1999 that the Album of the Year category has included no white male artists or groups composed entirely of white men. Reihan Salam is a contributing editor at The Atlantic and the executive editor of National Review. I certainly don?t mean to single out Harvard. As the senior assistant director of admissions at Yale recently observed, ?for those students who come to Yale, we expect them to be versed in issues of social justice. Jeong was born in South Korea in 1988 and moved to New York City with her parents when she was three years old. She attended the University of California, Berkeley, and Harvard Law School, where she was editor of the Harvard Journal of Law & Gender. In August 2018, Jeong was hired by The New York Times to join its editorial board as lead writer on technology, commencing in September. Sarah Jeong, newly hired member of the New York Times?s editorial board, hates white people. May God have mercy on any white, heterosexual, Christian male police officer who falls under the gaze of the New York Times. Because Jeong certainly won?t. The fact of her obsessive hatred seems clear. The reasons for it are less clear. Of course, hating white people isn?t a particularly distinctive or unusual way of branding. But if you pour on the vitriol and crank up the volume, it can work. It worked for Sarah Jeong, whose brand is now world-famous. She will probably never want for gainful employment. ?Are white people genetically predisposed to burn faster in the sun, thus logically being only fit to live underground like groveling goblins?? opined Sarah Jeong before The New York Times snapped her up. Felicia Marie-Nicole Smith was charged Saturday with first-degree murder in the death of Levi Cole Ellerbe, police said Monday. Authorities received a 911 call around 9:10 p.m. on July 17 about a child being taken from a home at Mayberry Trailer Park. An unidentified mother told police two people sprayed her in the face with a chemical, possibly mace, and barged into her trailer. She said she fled the trailer to escape the attackers. When she returned, her 6-month-old son was gone. Officers began searching the area for the missing child until they received a call around 10:20 p.m. about a fire near Breda Avenue, about a mile away from where the boy was taken. Police found a baby with burns on his body. He was airlifted to a hospital where he later died. The band U2 ended a concert in Berlin on Saturday partway through its performance after its lead singer, Bono, said he had lost his voice. Henrik discuss what the Globalist and U2 singer Bono said at a concert in France in the wake of the Swedish election. Bono declares his open racist hatred of Swedes and came down on how Swedes look. Saying that the traits of the Swedes: tall, blonde and blue-eyed is "boring." We show that he has ties in with lobby groups and international organizations that actually promote population replacement, so this his feelings are really not surprising. Paul David Hewson, KBE OL (born 10 May 1960), known by his stage name Bono (/ˈbɒnoʊ/), is an Irish singer-songwriter, musician, venture capitalist, businessman, and philanthropist. He is best known as the lead vocalist and primary lyricist of rock band U2. Bono was born and raised in Dublin, Ireland. Paradise California ,... Many retiree's left for the mountains ... They thought they were safe here ..
Paradise is a town in Butte County, California, United States in the Sierra Nevada foothills above the northeastern Sacramento Valley. As of the 2010 census, the town population was 26,218. On November 8, 2018, a major wildfire, the Camp Fire, destroyed most of Paradise and the adjacent Concow communities. The 2010 United States Census reported that Paradise had a population of 26,218. The population density was 1,430.9 people per square mile (552.5/km?). The racial makeup of Paradise was 24,129 (92.0%) White, 112 (0.4%) African American, 301 (1.1%) Native American, 330 (1.3%) Asian, 24 (0.1%) Pacific Islander, 416 (1.6%) from other races, and 906 (3.5%) from two or more races. Hispanic or Latino of any race were 1,836 persons (7.0%). Researchers found that people who don?t feel ?very strongly? about their national identity were most likely to consider life outside the U.S.
KENT, England ? A third of natural-born Americans have thought about packing up and living elsewhere ? outside the United States ? at some point in the future, but it may not be for the reason you think, a new study finds. The researchers used data from a 2014 nationally representative survey of 877 U.S.-born citizens still living in America, and found that besides exploration, other top reasons to live abroad included retirement (51 percent), escape from bad or disappointing situation in America (49 percent), or for work (48 percent). Participants were asked whether or not they?d aspired to live outside the U.S. for a period of time in the future. Identity politics has destroyed the Left in this country and replaced it with the Alt-Left. What blacks were to the KKK in the 1960s, straight white males are to the Alt-Left. Same bigoted mindset, just different object of mindless hatred and intolerance. And yet virtue-signaling alt-leftists actually have the nerve to project that hatred and intolerance onto anyone who dares disagree with them. That's why increasing numbers of Americans are getting sick to death of listening to these self-righteous, race-baiting, hypocritical control-freaks arrogantly lecture them all day from atop their moral high-horse. It's also why I refuse to waste my time arguing with such people. You can't reason with somebody when there's nothing to reason with. Goldstein isn't that Jewish ? And she's for White Genocide ? Israel Goldstein (June 18, 1896 ? 1986) was an American-born Israeli rabbi, author and Zionist leader. He was one of the leading founders of Brandeis University. In 1945, he was a consultant to the U.S. delegation at the Founding Conference of the United Nations in San Francisco. On his eightieth birthday, Israeli prime minister Yitzhak Rabin and other government and Zionist movement officials gathered at his home to pay him tribute. Keren haYesod ? United Israel Appeal (Hebrew: קרן היסוד‬, literally "The Foundation Fund") is the official fundraising organization for Israel the world over (apart from the US), with campaigns in 45 countries. Its work is carried out in accordance with the Keren haYesod Law-5716, passed by the Knesset in January 1956, granting the organization a unique fundraising status. It is a registered corporation of the State of Israel. One of Israel?s three ?National Institutions?, Keren haYesod works in close coordination with the Government of Israel and the Jewish Agency for Israel to further the national priorities of the State of Israel. The article you are trying to read has been reported by the community as hateful or abusive content. For more information about our reporting system head to our about page. One of the more common memes that I've seen white supremacists spread around recently has been 'diversity is a code word for white genocide'. The concept here is that diversity is only promoted in white nations, and that the end goal is to eliminate white people altogether by flooding all white countries with non-white people until there are no white people left. Well, guess what, white supremacists? That's exactly right. Diversity IS about getting rid of white people, and that's a good thing. First off, I am a white person myself, so allow me to get that out of the way. I'm extremely glad that the white race is dying, and you should be too. White people do not have a right to exist. Period. That may sound like a bold statement, but it's entirely true. Any white person with even the faintest knowledge of history should curse themselves every single day for being white. Throughout all of recorded history, whites have engaged in oppression, genocide, colonialism, imperialism, and just plain evil on a massive scale. White people have denied every other race the right to exist, and have at some point in history oppressed every single race on the planet. Co-Creator of the Pill Laments Resulting Demographic "Horror Scenario"
Watch Live: Thousands Gather on National Mall to ?March for Life? The annual rally attracts individuals from across the country who gather despite frigid winter weather to express their support for overturning the law and advocate for national policy that honors life from conception to natural death. The rally program will begin at noon, at which time a video will appear above. The event will conclude after participants march to the steps of the Supreme Court. Pro-life lawmakers will be speaking at the event, including Sen. Steve Daines (R-MT) and Rep. Chris Smith (R-NJ). Vice President Mike Pence will be the keynote speaker at the March for Life Rose Dinner on Friday night. March for Life 2019 is celebrating how science and technology have revealed the humanity of the child in the very first stages of development in the womb. The theme of Friday?s March for Life ? the world?s largest pro-life event ? is ?Unique from Day One: Pro-Life is Pro-Science.? In case anyone still needs confirmation, the rage and frenzy surrounding the supposed standoff caught on video last week between Covington Catholic High School students and an anti-Catholic, Native American activist demonstrates as nothing else has lately that the political left?s primary aim, the end game of identity politics, is the demonization of white Christian men. Covington student Nicholas Sandmann (pictured above) was the unfortunate epicenter of this tempest-in-a-teapot concocted entirely by the activist media, in which he and his classmates were falsely portrayed as racist bullies surrounding and taunting a frail Native American ?elder,? Nathan Phillips. The truth ? that it was the schoolboys who were verbally assaulted by Black Hebrew Israelite activists, and that Sandmann did and said nothing but stand his ground and smile in the face of Phillips? provocation ? swiftly came to light, but not before the entire country had squared off over the lie. It wasn?t that the news media got the story wrong, which would imply that they made a mistake, but that they didn?t care about getting it right. They didn?t care, because they saw an opportunity to dehumanize a white male wearing that triggering symbol of white supremacy, the ?Make America Great Again? cap, and decided to run with a narrative that could be weaponized against President Trump and his ?angry white male? supporters. ?Pick the target, freeze it, personalize it, and polarize it,? master strategist Saul Alinsky once taught, and Catholic white boy Sandmann became the left?s target of the moment. It's an incredible charge to be made by the first black American president, a man who received 69.5 million votes from his countrymen in 2008 and 65.9 million votes from apparent racists in 2012. "The legacy of slavery, Jim Crow, discrimination in almost every institution of our lives. You know, that casts a long shadow and thats still part of our DNA thats passed on. Were not cured of it. Racism we are not cured of, clearly." It seems that Native Americans are in religious conflict. USA will attack on Venezuela. 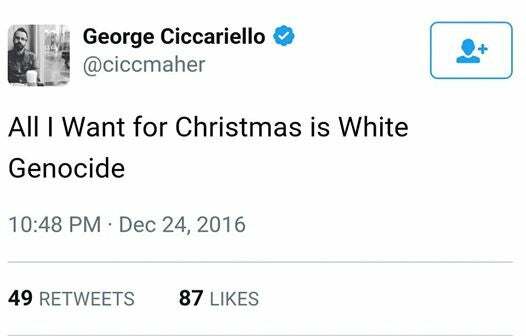 That is real WAR ON WHITES. White Genocide theory was developed by the neo-Nazi David Lane in his "White Genocide Manifesto"
In fact if you dig far enough, it can be traced back to a publication of Nazi Germany. (CNN)China has vociferously defended its human rights record at the United Nations, after accusations were made that more than a million Uyghur's have been imprisoned in political reeducation camps. The UN Committee on the Elimination of Racial Discrimination has been hearing testimony on the Chinese government's treatment of its Muslim Uyghur minority, among other issues. In their submission to the committee, the Germany-based World Uyghur Congress (WUC) said they estimated at least one million Uyghurs were being held in political indoctrination camps as of July 2018. Black Supremacists Harass Covington Catholic Students at March for Life. PROFANITY. Scholars of antiquity differentiate between genocide and gendercide, in which males were killed but the children (particularly the girls) and women were incorporated into the conquering group. Jones notes, "Chalk and Jonassohn provide a wide-ranging selection of historical events such as the Assyrian Empire's root-and branch depredations in the first half of the first millennium BCE, and the destruction of Melos by Athens during the Peloponnesian War (fifth century BCE), a gendercidal rampage described by Thucydides in his 'Melian Dialogue'". The Old Testament documents the destruction of the Midianites, taking place during the life of Moses in the 2nd millennium BCE. The Book of Numbers chapter 31 recounts that an army of Israelites killed every Midianite man but captured the women and children as plunder. These were later killed at the command of Moses, with the exception of girls who had not slept with a man. The total number killed is not recorded but the number of surviving girls is recorded by the Book of Numbers as 32,000. Similarly, the Turko-Mongol conqueror Tamerlane was known for his extreme brutality and his conquests were accompanied by genocidal massacres. William Rubinstein wrote: "In Assyria (1393?4) ? Tamerlane got around ? he killed all the Christians he could find, including everyone in the, then, Christian city of Tikrit, thus virtually destroying Assyrian Church of the East. Impartially, however, Tamerlane also slaughtered Shi'ite Muslims, Jews and heathens." Christianity in Mesopotamia was hitherto largely confined to those Assyrian communities in the north who had survived the massacres. Tamerlane also conducted large-scale massacres of Georgian and Armenian Christians, as well as of Arabs, Persians and Turks. Genocide in South Africa: now that's a black-and-white issue There are two ways of looking at this tragedy but only one of them can be expressed. Rod Liddle. The Ukrainian Genocide of 1932?33. It was part of the wider Soviet famine of 1932?33, which affected the major grain-producing areas of the country. During the Holodomor, millions of inhabitants of Ukraine, the majority of whom were ethnic Ukrainians, died of starvation in a peacetime catastrophe unprecedented in the history of Ukraine. Since 2006, the Holodomor has been recognized by Ukraine and 15 other countries as a genocide of the Ukrainian people carried out by the Soviet government. Early estimates of the death toll by scholars and government officials varied greatly. According to higher estimates, up to 12 million ethnic Ukrainians were said to have perished as a result of the famine. A U.N. joint statement signed by 25 countries in 2003 declared that 7?10 million perished. Migrant Admits to Killing Italian Man Because He Was ?White, Happy? A Moroccan migrant has admitted to murdering Italian man Stefano Leo, claiming that he wanted to kill someone ?young, white and Italian.? Said Mechaout, 27, born in Morocco but a naturalised Italian citizen, confessed to the killing, which occurred on the banks of the river Po in Turin on February 23rd, claiming he had purposely been waiting to kill a white Italian near his own age, Il Giornale reports. ?I hit a white, based on the obvious fact that a young Italian would have caused a sensation,? he allegedly told police. ?I looked at him and I was sure he was Italian. I wanted to kill a guy like me, take away all the promises he had, children, remove him from his friends and relatives,? Mechaout said. He added that he had been looking for someone ?happy? to kill when Stefano Leo passed by him wearing headphones and sunglasses. As Leo walked up the stairs to the street, Mechaout stabbed him in the throat. Italian investigators say that Mechaout had a son with a girl in Turin who had recently left him and that he was possibly motivated out of despair at his situation, along with not having a permanent job. The brutal murder specifically targetting a white Italian comes only weeks after a Senegalese migrant attempted to kill 50 Italian children by setting a school bus on fire to take revenge for migrants drowned in the Mediterranean sea. UPPER ST. CLAIR TOWNSHIP, Pa. (AP) ? When he moved to Pennsylvania about five years ago, it was a coin toss which party Brian Heitman would register with. Since Donald Trump?s election in 2016, Heitman, who is 42 and white, has become a reliable Democrat. Last week, he voted for the Democratic candidate in a special state Senate election in Pittsburgh?s affluent southern suburbs. ?A decade ago I probably wouldn?t have even noticed this election was happening,? Heitman said, ?but I?m making a point in voting in every one I can nowadays.? The Democrats? 2020 presidential primary may feature a historically diverse field of women and minorities, but in some ways it is testing how the party appeals to white men such as Heitman. Many Democratic politicians went into the last presidential campaign cycle taking little account of those voters, and banked on a coalition of women and minorities to carry them to victory. Trump?s victory proved that thinking wrong. Many in the party are determined now not to make the mistake again. That?s left Democrats wondering whether the nominee should be someone who can cut deep into Trump?s base, picking off large numbers of working-class whites, whether it?s enough to win over affluent, college-educated, suburban men and whether party is moving to far left to win them both. ?The white male vote is indispensable, it?s a part of any winning coalition,? said Democratic pollster Ronald Lester, who worked for Hillary Clinton?s campaign in 2016. He noted that successful national Democrats perform well with white men, and that includes Barack Obama, whose strength among white men in the Rust Belt helped fuel his White House victories in 2008 and 2012. ?The revolt in these suburban districts wasn?t just about white women, it was also about white men,? said Anna Greenberg, a Democratic pollster advising the campaign of former Gov. John Hickenlooper, D-Colo. ?Just as there?s been a movement of white, college-educated women, there?s been a movement of white college-educated men. ?